A Tibetan monk who was hospitalised after being tortured in Chinese police custody has been rearrested and sentenced to five years in prison for unknown reasons. A Tibetan monk who was hospitalised last year  after suffering severe beating and torture in Chinese police custody has been rearrested and sentenced to five years in prison. Lobsang Jinpa, 31, a monk at the Nyitso Zilkar monastery in Tridu region of Keygudo, eastern Tibet, was re-arrested from his monastic quarter on February 23. Lobsang Sangyal, an exiled monk told Phayul that a Chinese court in the region sentenced Jinpa to five years in prison for unknown reasons.“I have been trying to get more details about the court sentencing and Lobsang Jinpa’s condition and whereabouts but all attempts at establishing contact have failed,” Sangyal said. Lobsang Jinpa is son of Tagyal and Pema Tsomo. He was earlier arrested in September 1, 2012 with four other monks, Sonam Sherab, 45, Sonam Yignyen, 44, Ngawang Monlam, and Kalsang Tsultrim, during a surprise raid at the Monastery by Chinese security officials. Chinese security forces had arrived in large numbers and confiscated electronic items, including computers and CDs from the quarters of the five monks. Other monks of the Monastery who pleaded for the release of those arrested were severely beaten. Sonam Sherab and Sonam Yignyen were later sentenced to two years in prison by a Chinese court in Siling city on unknown charges, while Ngawang Monlam was detained for a month and later released due to a disability in his leg. According to the same source, Lobsang Jinpa and Kalsang Trultrim were beaten and tortured in prison by Chinese police and were severely injured. “Their condition was so serious that that they had to be hospitalised,” Sangyal said. Tsultrim Kalsang is still in hospital, recovering from his injuries. People have expressed fear that he too is likely to be sentenced once he recovers and is discharged from the hospital. The initial arrest and the sentencing are believed to have been carried out in connection with the peaceful protests that engulfed the Tridu region on February 8, last year. Thousands of Tibetans in the region had taken part in a peaceful protest coinciding with the global solidarity vigil called by the exile based Central Tibetan Administration. 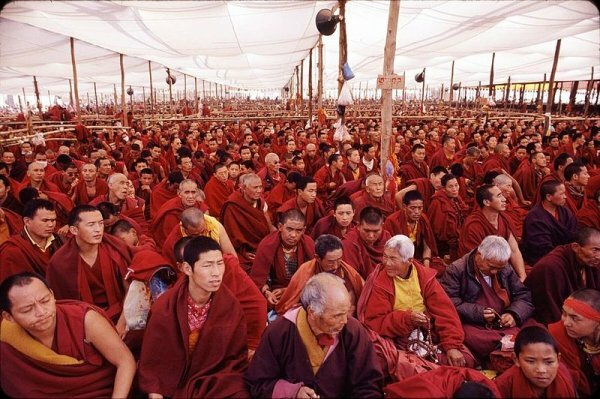 Around 400 monks from the Zilkar monastery had led the protest march to Zatoe town with banners, written in blue and red ink, symbolic of the two protector deities of Tibet, calling for the Dalai Lama’s return, release of Tibetan political prisoners including the XIth Panchen Lama and respect for Tibetan lives. Although no arrests were made during the protest, three Zatoe monks - Sonam Gyewa, Lobsang Samten, and Lobsang Nyima were arrested on February 16 and later sentenced by an Intermediate People's Court in Siling at a secret trial without the presence of the monks' family members.